This specific treatment against hair loss acts simultaneously on the hair fiber, the scalp and the bulbs in order to guarantee an optimal efficiency. 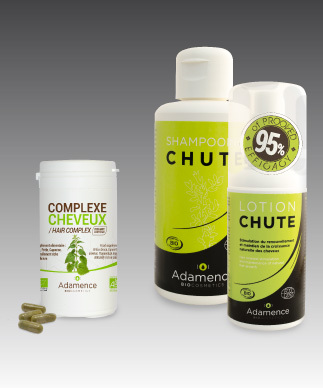 This unique treatment, tested under medical control, has a proven efficacy of 95% against hair loss. The Beauty range Adamence draws its virtues from the nature, with natural ingredients and ingredients from organic farming : Aloe Vera, Sweet Orange, Shea Butter, precious oils : Jojoba, Argan, Sunflower, Hazelnut ...). Everything for the beauty of your hair! Capillary Beauty range Adamence, certified Ecocert and Cosmebio. 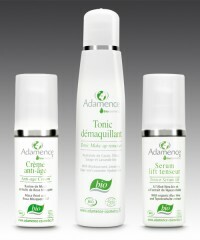 The Adamence organic face care range is the result of perfect fusion between nature and science. The whole range of this organic cosmetics is hypo allergenic and therefore perfectly adapted to sensitive skins, as well as to young or mature skins. Range with beautiful textures and fragrances. 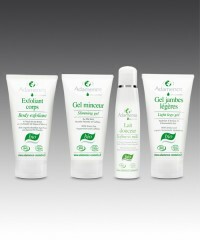 Adamence organic body care products offer daily treatments specialized for well-being. This hypo allergic organic cosmetic range was born from the unique encounter of professional nature lovers with multitudinous ingredients across all continents. Range specially designed to meet the specific demands of sensitive and fragile skin, whether young or mature.